News is the biggest news at Facebook as the social media giant embarks on a brand-new standalone iOS news reader app called Paper. While Facebook is designed to deliver content that speaks to the user’s specific interests and inner circles, Paper performs more like an actual newspaper by displaying content based on the editor’s preference and prudence to present the big picture in news, just on a smaller digital screen. TechCrunch.com explained why Paper may turn the page to a new age in newspapers. Paper is the first app created by Facebook Creative Labs, which is an initiative designed to develop single-purpose experiences instead of squeezing more functionality into Facebook’s main app. The group’s goal is to accomplish Facebook’s focus on conquering the mobile market. Paper presents a broad range of news, ranging from posts about popular public content to articles that editors think users may enjoy but may not have sought out on their own. Paper is different from the typical Facebook News Feed experience because that content is curated by the user’s friends based on their individual interests. Yet for users whose personal preferences differ from their friends’, that kind of content may not appeal to them. But Paper presents a more diverse display of news without the user having to seek it out or subscribe to specific sources. On Paper’s front page, users will see a revamped interface for the News Feed with large photos and videos filling the top half of the screen, and link stories and status updates covering the bottom half. 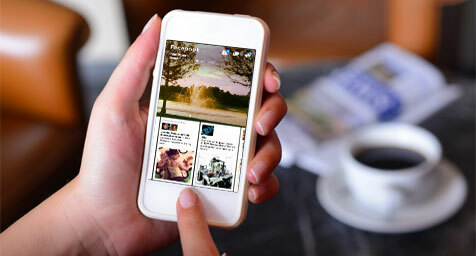 Users can browse through the articles by swiping the screen from right to left. Tapping on a title opens up the article and allows it to fill the screen, while pinching it folds the article back up and returns the user to the Paper feed. While the content is chosen for mass appeal, users can personalize their Paper experience by adding Sections that appeal to their interests, such as sports, business, world news, food, ideas of the day, and more. The stories in each Section are selected by Facebook’s human editors and surfaced by the Paper algorithm that have been posted publicly to Facebook by a variety of sources. This ensures that the articles come from a mix of major news outlets, industry insiders, undiscovered bloggers, and general opinions. For now, users who select a Section will all see the same stories, but the Sections may become personalized as Paper progresses. In addition, users can share their own stories. But unlike on Facebook where users can submit their stories yet not know whether the final feature will be cut off or which photo will appear, Paper provides a preview of the finished article so people can publish their stories will complete confidence. Paper has no plans for ads at the present time, but Facebook is trying to figure out how to integrate them in a natural and non-intrusive way. If Paper performs well, it could integrate modern social media elements into the traditional newspaper experience and herald a whole new age in newspapers. Take a look at the latest in social media. Contact MDG Advertising today at 561-338-7797 or visit mdgadvertising.com.